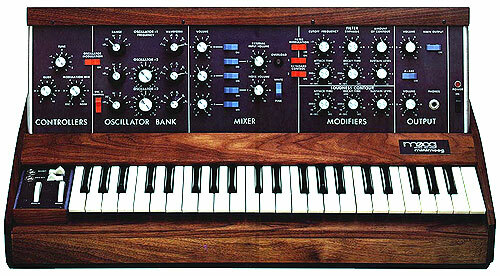 The Minimoog has six sound sources. Five of these (three voltage-controlled oscillators with switchable waveforms (triangle wave, sawtooth wave, a combination of the sawtooth and triangle wave/reverse sawtooth or ramp wave in oscillator three, square wave and two different width pulse waves), a noise generator, an external line input) pass to a mixer with independent level controls. The mixed output of the sources is then passed through the voltage-controlled filter (VCF) and a voltage-controlled amplifier, each of which has its own ADSD envelope generator. The envelopes are ADSD as the decay setting also sets the time for what's regularly known as release, a "shortcoming" that doesn't seem to diminish the Minimoogs popularity in any way. There is also a switch above the pitch- and modulation wheels to engage the final decay stage as well as a switch for engaging the glide circuit. 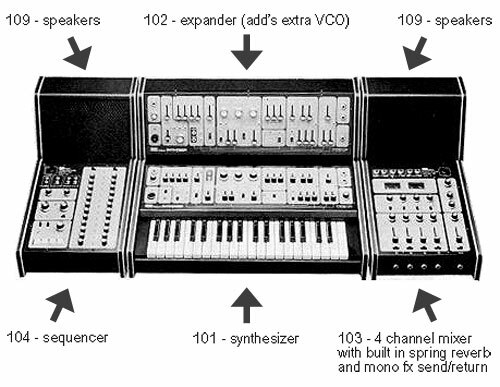 The VCF can itself be made to oscillate, thus comprising the Minimoog's sixth sound source. The VCF is of transistor ladder type, a design patented by Moog music and even defended in court. 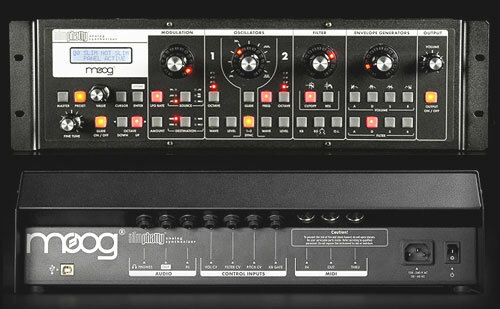 The Minimoog can be controlled using its in-built, 44-note keyboard, which is equipped with modulation and pitch-bend wheels or by feeding in an external one-volt-per-octave pitch-control voltage and triggering the envelope generators with an inverted trigger. External pitch control does not pass through the glide circuit, nor is presented to the VCF tracking switches and thus, the external inputs were not designed for external keyboard control. The lowest note played on the keyboard determines the pitch, a condition that is referred to as low-note priority. The envelope generators do not retrigger unless all notes are lifted before the next note is played, an important characteristic which allows phrasing. The modulation and pitch-bending wheels were an innovation that many instrumentalists found to be extremely playable. The pitch-bend wheel is on the left of the modulation wheel. It is normally kept in the centered position. It is not spring-loaded; the player must return it to the centered position to play in tune. There is a delicate detent mechanism to help the player find the center position tactually. In sharp contrast to later synthesizers that also have pitch-bend wheels, there is no deadband near the center of the wheel's travel; the wheel produces minute changes in pitch no matter how slightly it is moved in either direction. The wheel can therefore be used to introduce slight vibrato or nuance, as well as accurate pitch changes. However, Moog later recommended adding a deadband mod and published this mod in their factory service notes. The detent mechanism can be somewhat adjusted in its strength. Well, what can I say? Sounds great, looks great and feels great to play live with... 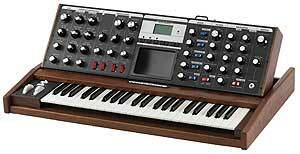 However, I don't use my minimoog to play live with anymore but I still use it sometimes for bass-sounds and sound-effects in my studio. 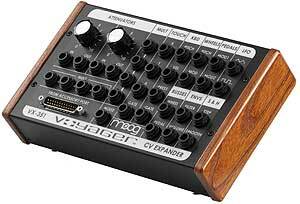 Some people complains about unstable oscillators but I have never had any problem with my minimoog. any better sounding synth than this? because it sounds totally different. tick then scooped the bits up and popped them in the skip. 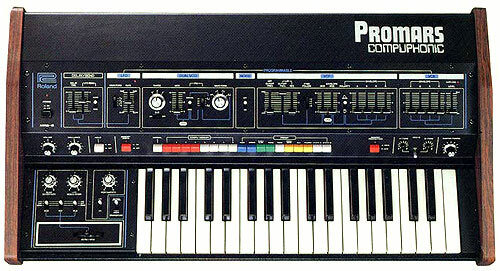 For me one of the best synth ever. I have a Lintronics Minimoog with Midi. 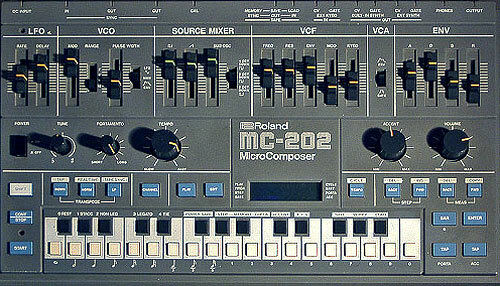 It includes an internal LFO, which can be used in addition to, or in place of the host synth's LFO. Pitch, pitch bend, filter cutoff, loudness, modulation amount, and the internal LFO's rate and depth, all may be controlled through MIDI in real time. 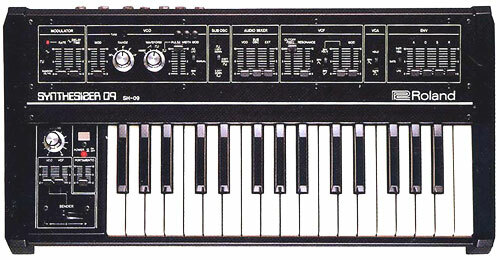 In addition, the Glide and Decay functions may be turned on and off through MIDI.